Even though the poaching of elephants is a huge problem in Africa, we were lucky enough to see lots of elephants on this trip. Park police have begun arresting anyone in possession of a high powered rifle in the national parks. 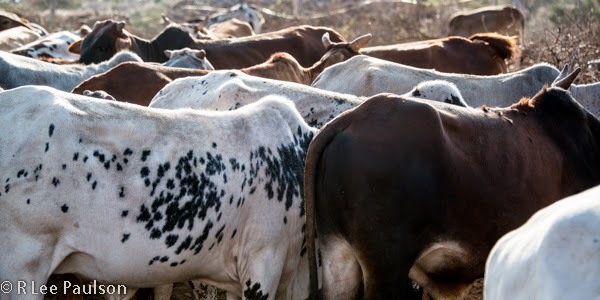 This has caused poachers to change tactics. Poachers have begun poisoning entire watering holes, killing not only elephants, but other animals who happen to drink there as well. 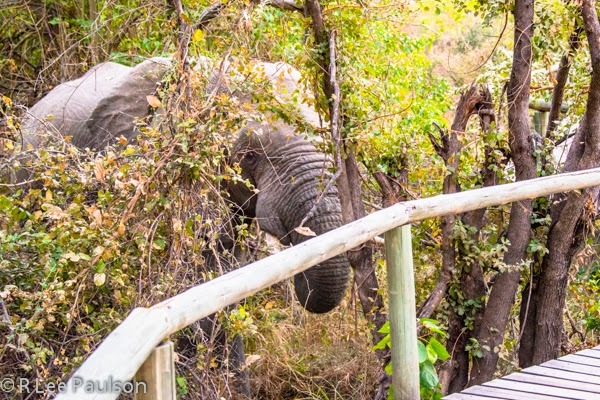 I've mentioned before about how competent our African guides were. This is another example. 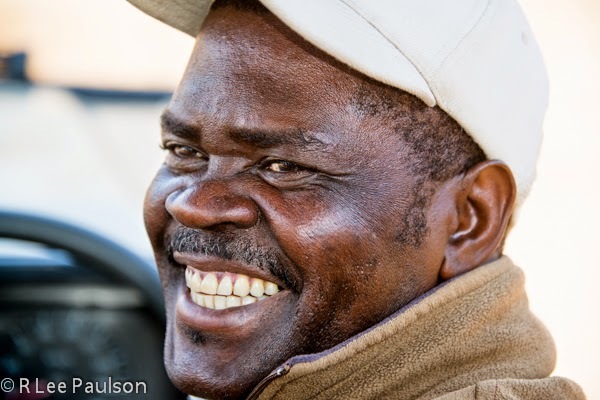 We were driving down the road after lunch when our guide, Abram, stopped the truck. Lion, he said, pointing. We looked out over the horizon and, even with binoculars, saw nothing but termite mounds. 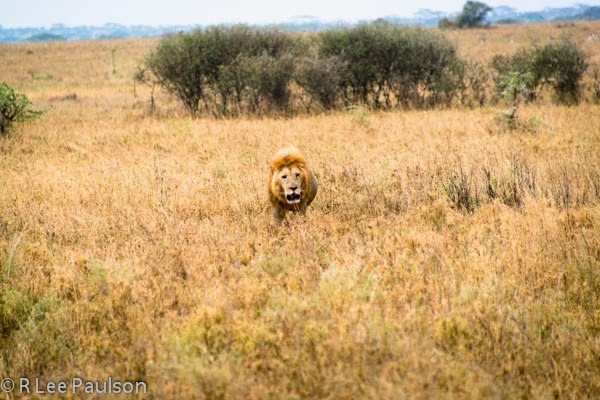 But, sure enough, a few moments later the lion came into view. Africa 34:We Get Up Close and Personal with a Leopard. 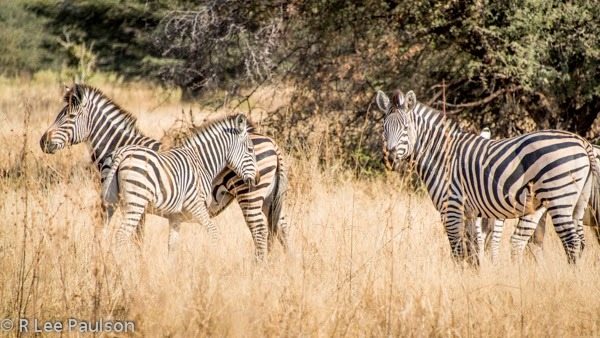 Experienced guides will tell you that seeing animals on safari is a lot about luck. It's about being in the right place at the right time. 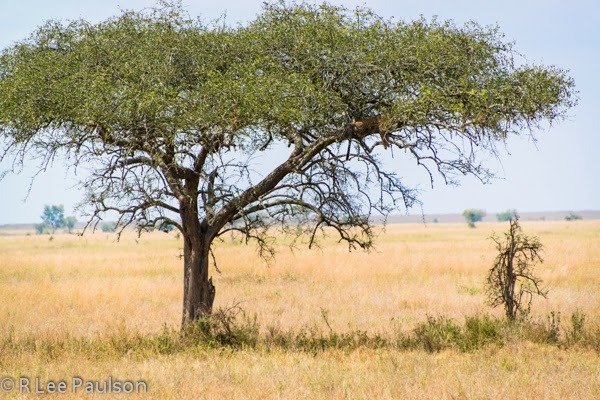 Driving down the road in the Serengeti, one sees a lot of Acacia trees. This one, however, was different. In this one, a leopard happened to be sleeping. 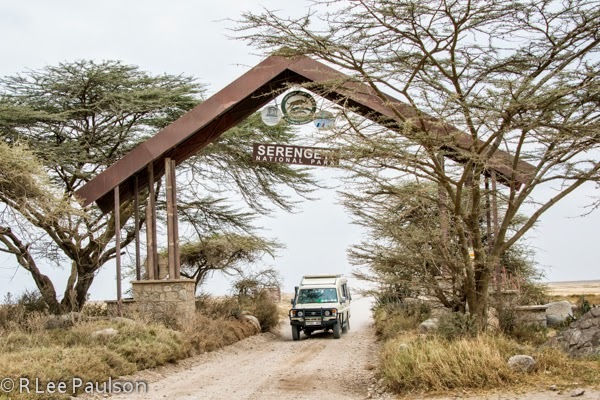 The Sarengeti National Part abuts the Ngorongoro National Wildlife Sanctuary. Combined, the two areas make a huge, 8,900 square mile, habitat for the animals to live and roam. 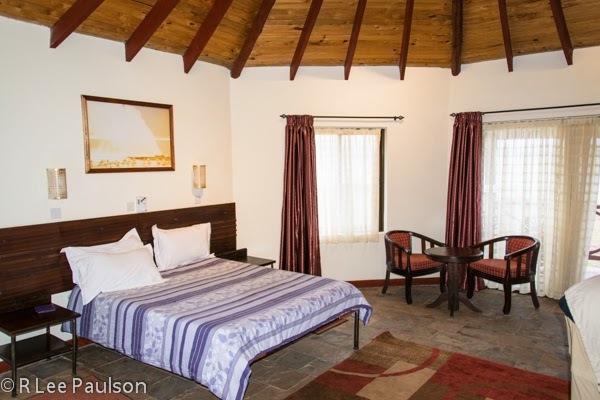 Ngorongoro Crater is the world's largest inactive, intact, and unfilled volcanic caldera. The crater, is 2,000 feet deep and its floor covers 100 square miles. 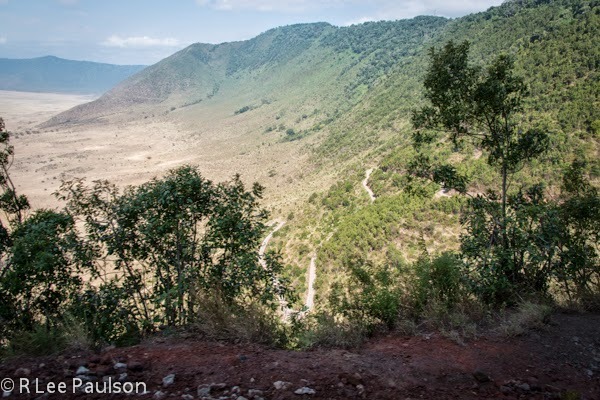 We descend down into the crater via a steep, winding road. The Maasai are a nomadic people who live in what is called East Africa's Great Rift Valley, an area that borders Kenya and Tanzania. Large chunks of that area are now national wildlife refuge parks. Maasai warriors are well known for their fearlessness and ferocity, especially when it comes to protecting their precious cattle. 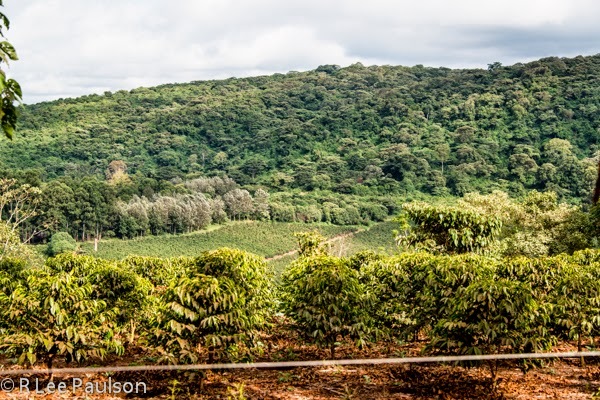 Africa 29: Have You Ever Seen Where They Actually Grow Starbucks Coffee? It turns out the area around Karatu Village has soil that is perfect for growing coffee. Large coffee plantations, mostly owned by foreigners, dot the landscape here. We spent the night at Karatu Village in Tanzania. 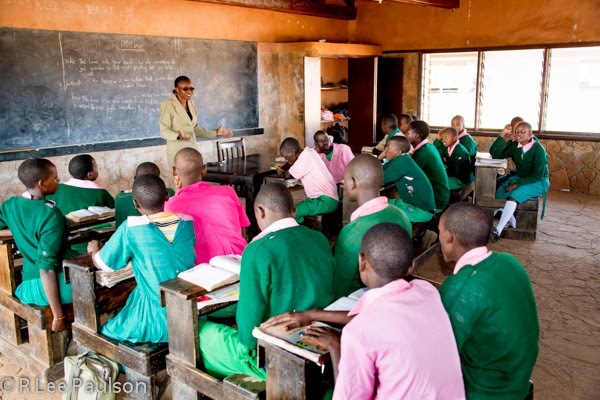 Karatu Village is roughly half way between Lake Manyara and Ngorongoro Crater. 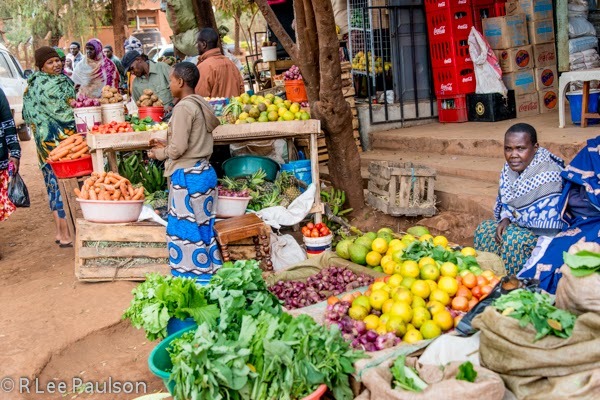 Karatu Village has a thriving market and shopping district. We were driving north along the shore of Lake Manyara, looking at birds. 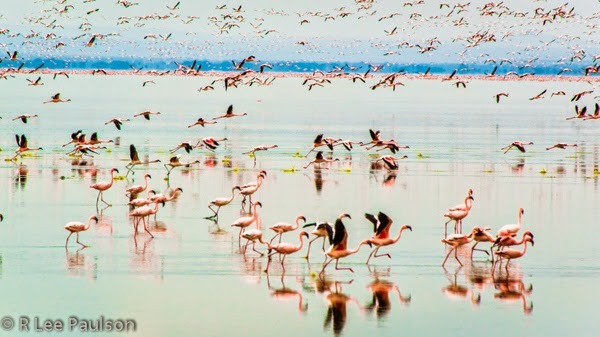 Literally, millions of birds, like these Flamingos. 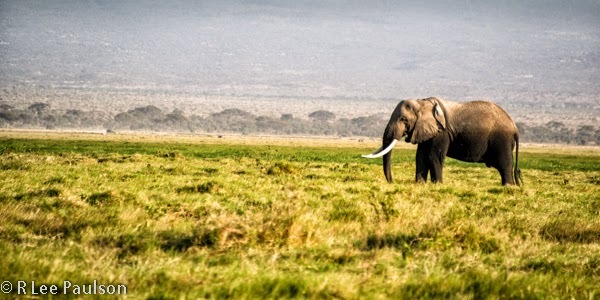 Amboseli National Park is quite a bit south of Lake Nakuru, near the Tanzanian border. 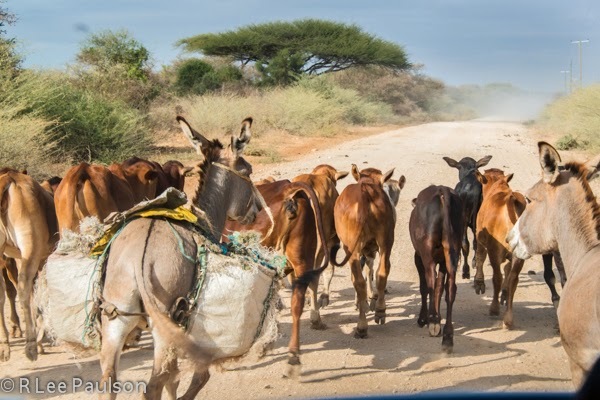 On our way to Amboseli National Park, we encountered others using the same back roads as us. 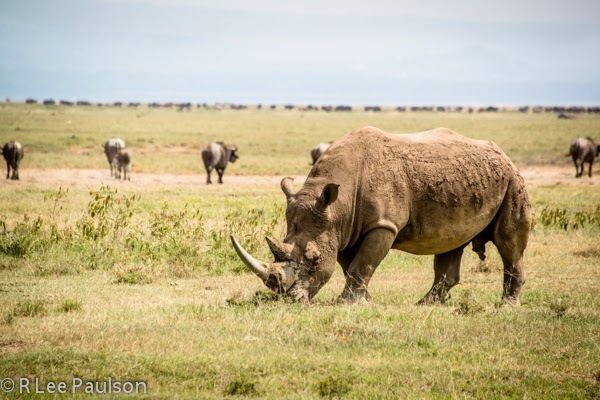 We first visited Lake Nakuru National Park, where we saw our first Rhino up close in the wild. He was grazing in a huge grassy plain, about 100 feet from the road. Of course, we stopped. 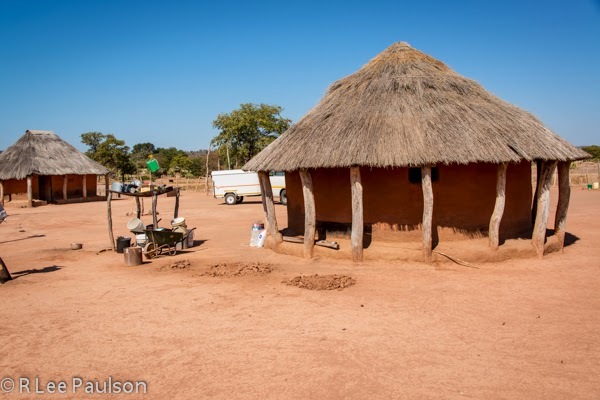 Africa 23: Modern World Lives Side By Side with the Traditional. We arrived at our first camp in Kenya, Sentrim Elementaita Lodge. It was a lovely place on a lake's edge. It was a comfortable as any hotel we've stayed at, anywhere. Kenya has a few paved highways, but not nearly enough for it's population. Traffic is heavy and crashes are numerous. 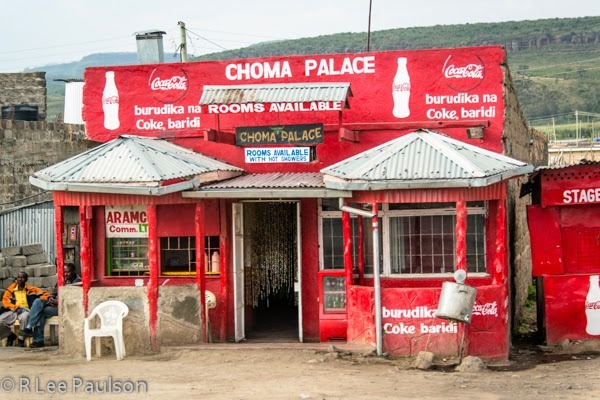 But traveling along those highways gives one a picture not normally seen of everyday life in Kenya. The first word that comes to mind is poverty. Poverty on a scale that is hard to comprehend for those of us who live in the west. After watching the bungee jumpers, we flew to Nairobi, Kenya via Johannesburg. One of our first stops on the road in Kenya was the Giraffe Center. 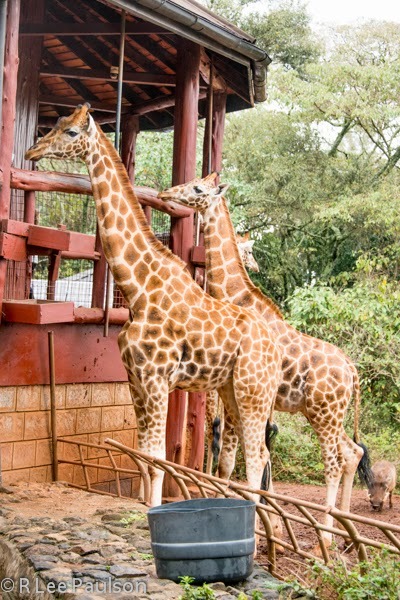 Opened in 1974 as a way of saving nearly extinct Rothschild giraffes, the center has created an safe environment where the Rothschilds have thrived and multiplied. 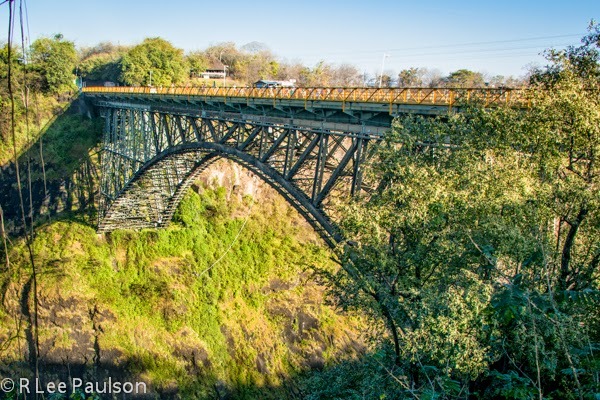 Look very, very closely at the photo below and you will see a thin, white line extending down from the middle of the bridge's arch. That white line is attached to a young woman woman who just jumped off the bridge. 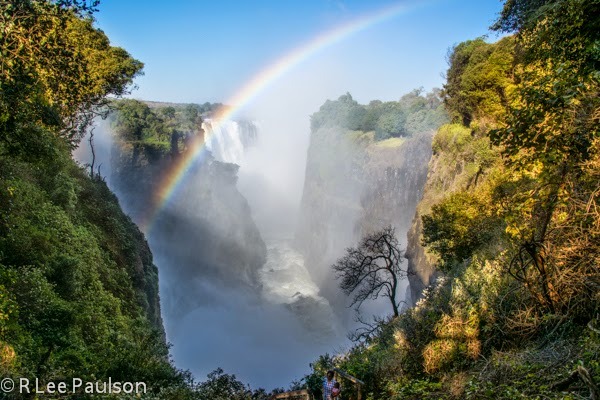 Victoria Falls is considered one of the wonders of the world. It is considered the largest sheet of falling water in the world. We're standing at the west end of the falls, here, looking straight down the roughly 350 foot wide gorge into which the water drops. Rinos have been poached nearly into extinction. Why? 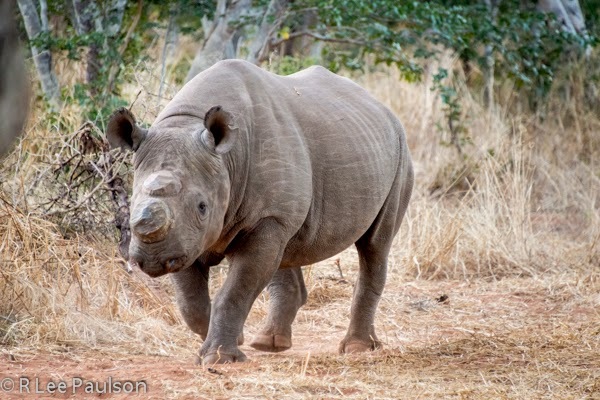 A single Rhino horn can fetch upwards of $50,000 or more. 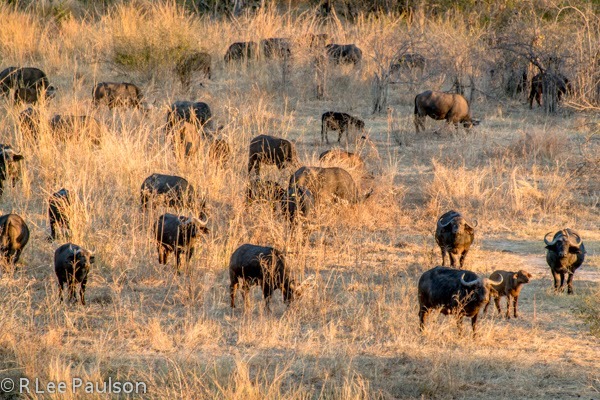 On our last day in Zimbabwe we visited a Rhino reserve. This is a five square mile, fenced and guarded sanctuary where Rinos can hopefully live in peace. 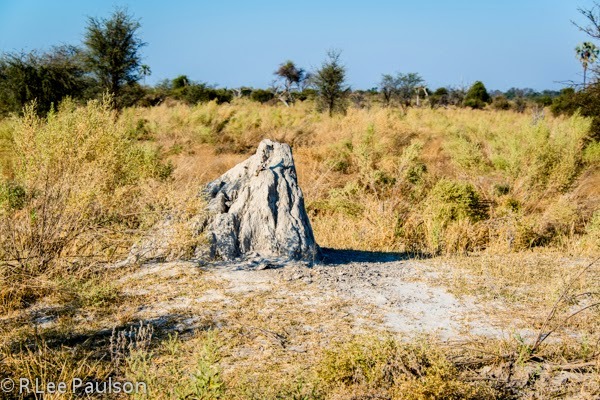 Termites and their distinctive mounds are found all over the African areas we visited. Termites are basically scavengers who clean up left over cellulose created by dead and dying plants. 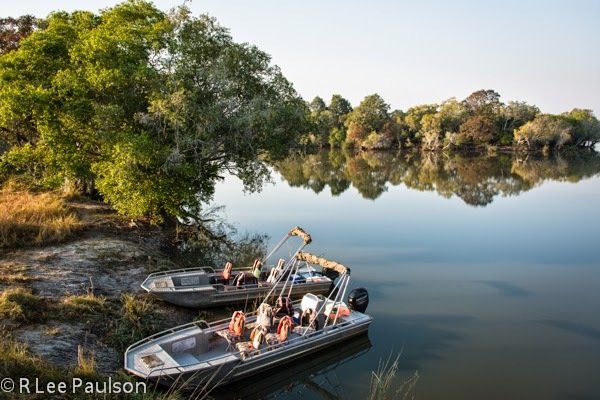 Our next camp was situated at the confluence of the Kafue and Lufupa Rivers in Zambia. 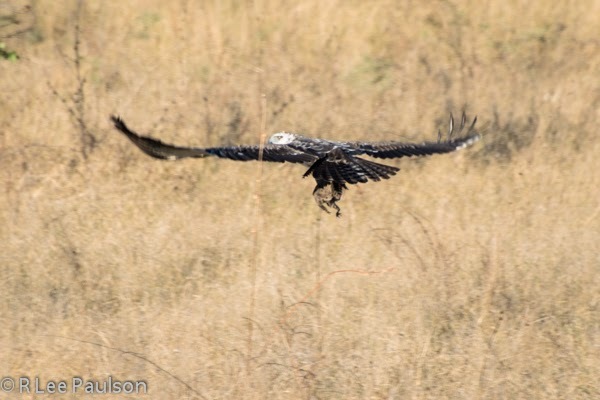 This area is in the middle of a huge game reserve. We spent a leisurely day in these boats exploring the rivers. 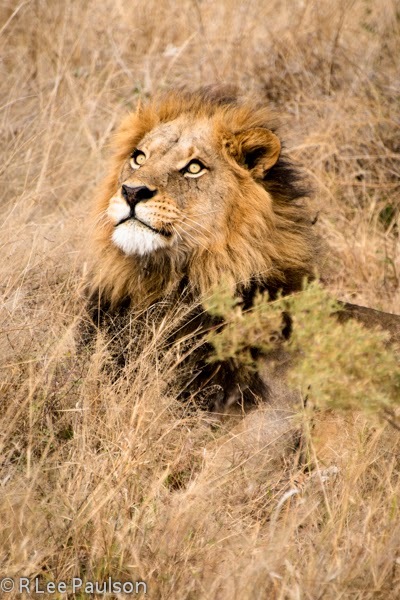 Africa 10: Lion Watches Plane Take Off. We Watch the Lion. 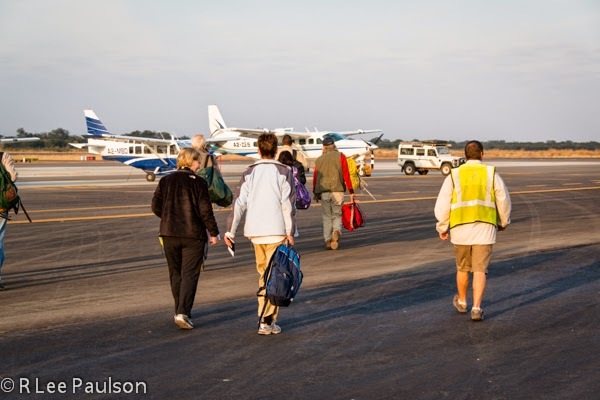 We climbed into the Land Rovers and headed down the runway to leave the airport. 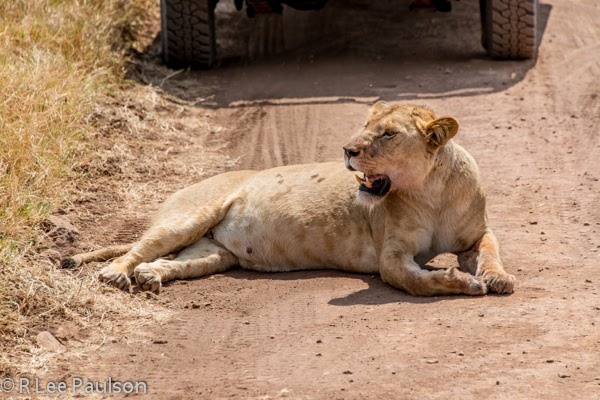 Toward the end of the gravel runway, we saw this lion sitting comfortably in the grass, watching the plane we came on take off again. We stopped and watched him. There are no roads that directly connected the camps where we were staying. So we traveled to our next destination, the Okavango Delta, via bush plane. We showed up bright and early at the Kasane airport and were surprised to find that we were about to board a "scheduled" flight. Turns out, there are enough tourists visiting the area to keep a small airline, consisting of Cessna Caravans, busy.